All First-Responders know the importance of equipping high-quality, dependable emergency vehicle lights on their service vehicles, as do those working in dangerous areas, like construction sites or on the side of the road. We’ve all seen emergency/warning lights flashing on many kinds of motorized vehicles from police cars to fire trucks, as they rush to an incident or are stationary on the side of a road. As motorists we know, or at least are supposed to know, what to do when we see flashing lights, no matter what colors they are. Flashing colored LEDs guide motorists through intersections, warn us of approaching danger, signal drivers to pull over and stop, and caution us to slow down and heed warnings. Tow Trucks, as well as construction vehicles must also be highly visible because of their sizes and proximity to motorists on roads and expressways. Bright warning lights are essential in managing traffic and keeping US ALL safe on the road. Emergency vehicle lights are visual warning gear used on vehicles when drivers need to alert others of urgency. Most people think only police, fire, and EMS use this types of devices, but the truth is you see these types of lights on all sorts of vehicles without realizing it. Emergency lights are used to provide warning of hazard or urgency on the road. 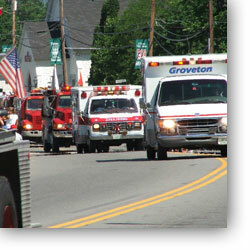 Cars or trucks driven by emergency personnel include; cop cars, fire trucks, and ambulances. Some states also see volunteer firefighters or EMS cars and trucks as emergency vehicles. Similar lighting is used by other occupations as well, like construction and utility vehicles, but usually in a different way. For the sake of this article, we will just focus on the types of vehicles and lights used by police, fire, and EMS. A good light has to get the job done; just ask any security guard or construction worker who has to really ‘SEE’ what they are doing...or be ‘SEEN’ while doing it! Sirens catch our attention, but it’s the combination of BLUE….RED….WHITE flashing lights that tells motorists exactly where a police car, fire engine, or ambulance actually is, then both sirens and lights indicate which way an emergency unit is coming from, and which way it’s going. When at an incident or work zone, it’s the flashing YELLOW lights that warn motorists to slow down, merge into one lane, or GET READY to STOP. We have a wide assortment of highly visible, aerodynamic Traffic Advisor light bars and strobing lights for the interior or exterior for any size vehicle. Choose one or more of ETD’s safety lights to manage traffic efficiently, keep an area safe and well lit, and caution approaching motorists. Sometimes, however, it’ not being noticed that will get the job done. For these times ETD has just the right Undercover and Hideaway lights that blend with the exterior. We also have Strobe Tube Kits that conceal up to 120 Watts in the head and tail lights of a surveillance unit. With these stealth lights in place, no one suspects anything until you hit the ON switch! Whether it’s a light bar for the roof, deck, or dash on a SUV or a small surface or grille mount light on a utility truck, almost every light used by government, police, fire, and municipal departments use Generation I, III, or IV LEDs as the light source. The powerful, high-intensity light produced by the tiny light emitting diodes in our light bars can be seen for miles through all weather conditions and are extremely bright, in fact, they are so bright that they come with a special warning. Our high-intensity, super-bright LEDs are made to last 100,000 hours and come with a 5 year limited warranty. Today, some emergency lights have over 30,000 lumens (more than 100 Watts) and are so bright they should never be stared at directly because of the overpowering glare. We offer numerous options on our products, too, so you can customize the lights you buy even more. In many lights, you get the choice of TIR or Linear 1 lenses; we also have Reflex Optic lenses that fan out to 180°. Takedown lights can be added that allow you ‘see’ into a vehicle when you’ve pulled over a motorist or produce a steady, direct light on an accident scene. Alley lights are another option to add to the ends of many of our light bars; they aid in patrolling the streets. You select the colors you want from solid color or split-color combinations and, with many of our surface mount and grille lights, you choose either chrome or black bezels. With these many available options you can create just the right light that serves you best! Click here for more information on mounting and color choices for emergency lights. We’ve got vehicle lights that hard wire into an existing light or siren system and are permanently mounted, and we’ve got several interior and exterior lights that ‘Pop-ON’ securely with magnets or suctions cups, so they are quickly mounted on anything you drive. They plug into cigarette lighter plugs, are easy to install, and ready ‘TO GO’. ‘Pop-ON & Go’ lights are particular favorites of volunteer First Responders because their POVs can become an active service unit in no time at all. No matter what type of emergency vehicle light you have mounted on your cars, SUVs, POVs, or trucks, they Must Meet Your Needs, Be Durable and Reliable, and Do the Job Effectively! Extreme Tactical Dynamics has put together a Multi-Function Light Inventory, with a wide assortment of safety and security lights with numerous options, so you can select the right light. And Extreme Tactical Dynamics always gives our customers the Highest Quality lights at the Lowest Possible Prices. We Serve Those Who Serve US so Well!